Which Rightline Gear Cargo Carrier is Right For My Minivan? All minivans on the market today have sliding doors, which makes this question a little more complex than it normally would be. If your minivan has a Roof Rack, you can attach any one of our Rightline Gear Car Top Carriers as shown in our Carrier Fit Guide. The carrier’s straps will loop around the roof rack side rails, cross bars, or both to hold the carrier in place. Here is where it gets tricky. When you do not have a roof rack, we have two methods to attach a car top carrier, running the straps through the vehicle and our Car Clips. 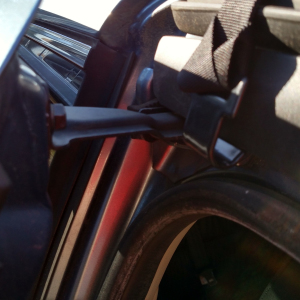 Whether your sliding door is automatic or manual, the door will get bound up in the straps when using our ‘Through The Vehicle’ method and it will knock the clips out of place when using our ‘Car Clips’ method as shown below. The bottom line is that no car top cargo bag on the market today can attach to minivans without a roof rack. 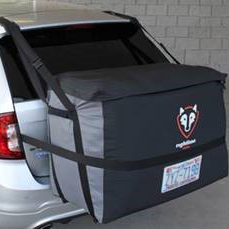 We are proud to say that Rightline Gear has a cargo bag solution that can work on minivans without a roof rack. Our Cargo Saddlebag attaches to the rear of the minivan to hold 13 cu ft of gear (more than our mid-size Sport 1 Carrier) using the Saddlebag Car Clips which attach the carrier’s straps to the gap between the minivan’s roof and the rear hatch door. The Saddlebag is 100% waterproof and rests on the back of your vehicle. Rightline Gear patented the Saddlebag, so we are the only company that offers this type of cargo carrier. The Cargo Saddlebag has the added benefit of saving ~5 mpg over car top carriers, and it’s easier to access while you’re traveling. Please contact us with any questions you have about using our car back carrier on your minivan. 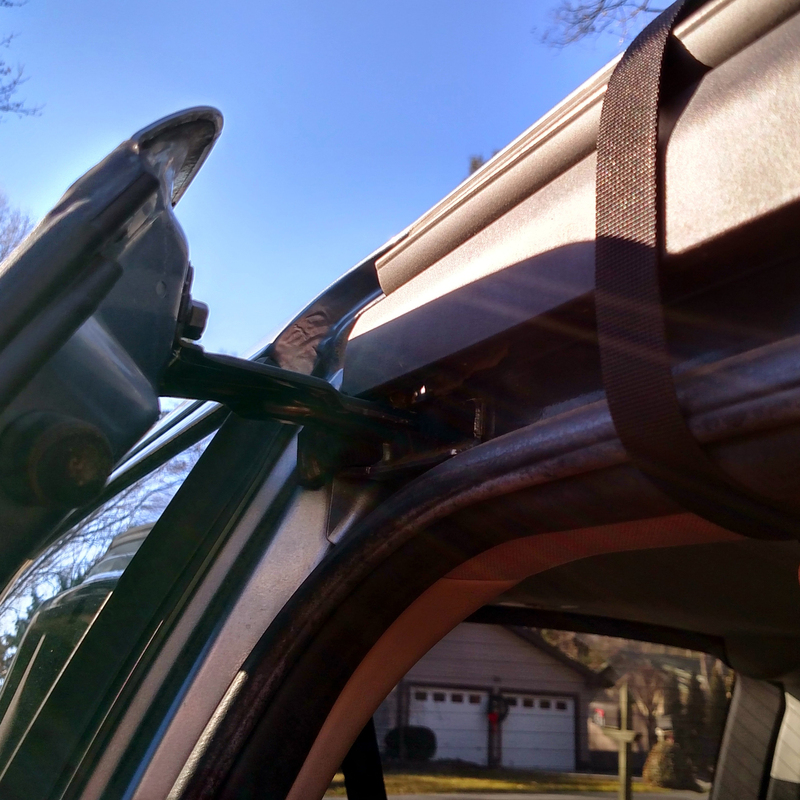 This entry was posted in Car Top Carrier Tips, Cargo Saddlebag Tips and tagged Cargo Saddlebag, Rightline Gear, Cargo Saddlebag | Honda Odyssey | Minivan, minivan, honda, odyssey, toyota, sienna. Bookmark the permalink. 6 Responses to Which Rightline Gear Cargo Carrier is Right For My Minivan? Yes, we make the Sport Car Top Carriers and the Cargo Saddlebag to be 100% waterproof. Rain or snow will not damage the carrier’s material. Cold weather typically causes PVC based materials to harden and become difficult to move and work with. We have a formulation of pvc in our products that resist most of the cold weather’s effect. How much weight can you put in the rear mount saddlebag before it will wreck the plastic spoiler at the top of the rear hatch on a honda odyssey? I assumed it would be unmountable due to the plastic spoiler piece but I noticed you have the same situation in the example image on this page. Hello. We recommend reading our blog article here: http://rightlinegear.com/blog/cargo-saddlebag-tips/the-rightline-gear-cargo-saddlebag-and-suv-fairings/ We recommend checking with your vehicle manufacturer for any associate weight limits, but a general weight limit for the Cargo Saddlebag is 100 pounds. You can mount the Cargo Saddlebag with or without a roof rack. If your Odyssey does not have a roof rack please be sure to also purchase the accessory Cargo Saddlebag Car Clips we offer through our retailers. 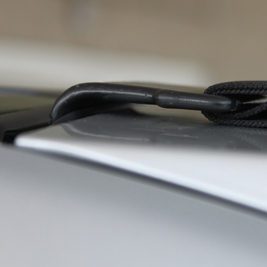 You can view these accessory clips here: http://rightlinegear.com/roof-cargo-carrier-accessories.html Our part number for the Saddlebag Car Clips is 100605. Is there a way to mount the saddlebag on top of the roof? I will be traveling with a hitch mounted bike rack and thus cannot put my saddlebag on the back of the car. Hello. We do not recommend attaching our Saddlebag to the roof of a vehicle. We recommend looking at our Car Top Carriers which are specifically designed to mount on a vehicle’s roof.